When it comes to a “one size fits all” network service, Metro Fiber Ethernet seems to be closest to meeting the criteria of a universal solution. Let’s see why that is and what Metro Fiber Ethernet can do for your business. Telecommunications network transport services have evolved through a rich set of technical options that can be generally classed into copper, fiber optic and wireless. Amazingly, copper-based telephone and broadband lines are still based on twisted pairs of small wires that can run for miles between a telephone company’s central office and the business location where they terminate. Copper can also include coaxial cable that is primarily used for cable broadband, often as part of a hybrid fiber coax network. Wireless involves microwave, cellular and satellite. A major application for wireless is portable and mobile operations where any type of physical connection just won’t do. Fiber has gone through its own evolution from a proprietary long distance telephone trunking system to the modern packet switched protocol that forms the heart of the Internet. It has also become the connection of choice for most business applications. The beauty of Ethernet over Fiber is that it perfectly mirrors the now universal Ethernet protocol running on local area networks. As you might suspect, it is pretty much seamless to connect your LAN to a Ethernet transport service to the Internet or to another LAN hundreds or thousands of miles away. Metro Fiber Ethernet is the name given to Carrier Ethernet over Fiber within populated areas. Ironically, perhaps, the growth of 4G and soon 5G cellular wireless has prompted a major deployment of metro fiber to cell towers well beyond the city limits. Traditional copper solutions just don’t have the bandwidth to support high speed broadband. Fiber has as much as you need… once you have the cables in place. Don’t assume that just because your business isn’t located in the downtown business district of a major metropolitan area that you can’t get fiber optic service. 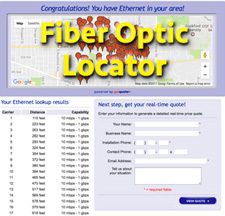 Fiber is become more and more ubiquitous, even in smaller towns and some rural areas. Unlike T-Carrier or SONET fiber technologies pioneered by the telephone companies, fiber optic Ethernet doesn’t require changing hardware every time to want to move up a level in speed. Most network equipment now supports 10/100/1000 Mbps, with some capable of 10 Gbps or 100 Gbps. These same service levels are available with Metro Fiber Ethernet. A typical fiber installation will include an edge switch or router with a Fast Ethernet (100 Mbps) or Gigabit Ethernet (1000 Mbps) port. The port speed determines the maximum, but not the minimum, speed of your connection. You order the bandwidth level you want and the carrier will rate limit the connection speed to that level, say 50 Mbps. If you find you need a faster connection, a quick phone call or online control panel change can increase that to 100 Mbps. If you have a Gigabit Ethernet port installed, you can change the speed to 250, 500, 750 or 1,000 Mbps at will. Of course, the price of your service will depend on the speed you select. This is commercial, not consumer, grade service. Regardless of speed, your fiber service will have high reliability, low latency, low packet loss and low jitter characteristics. Many carriers will spell out and guarantee the line performance in a SLA or Service Level Agreement. Ethernet service is also dedicated, not shared like cable or wireless broadband. You have exclusive use of the bandwidth so there is no congestion caused by competing with other businesses on a common line. This gives you consistently high performance that is important for mission critical applications. There are no data caps. You can use as much or as little of the maximum line capacity as your wish. Metro Fiber Ethernet can be thought of as a fast, nearly transparent, pipe. It can be your high speed connection to the Internet, a dedicated link to your cloud service provider, or a point to point line between two business locations. it can also be an “on ramp” to a larger MPLS network for linking multiple locations on a semi-private network that can include locations around the world. Metro Fiber Ethernet is being rapidly deployed to support 4G and 5G cell towers. It can easily provide the Internet service connection for a WISP or Wireless Internet Service Provider as well. This offers a business opportunity in areas not well served by telco DSL or cable broadband. Is your business being limited by inadequate Internet service or needing dedicated links to other locations? If so, you will likely be surprised by the cost and performance of Metro Fiber Ethernet service to your building.